A small asteroid the size of a city bus zoomed between Earth and the moon's orbit today, Friday Jan. 25, days after its discovery, but it never posed a threat to our planet, NASA says.The asteroid, 2012 BX34 passed within 36,750 miles (59,044 kilometers) of Earth when it made its closest approach at 10:30 a.m. EST (1530 GMT). 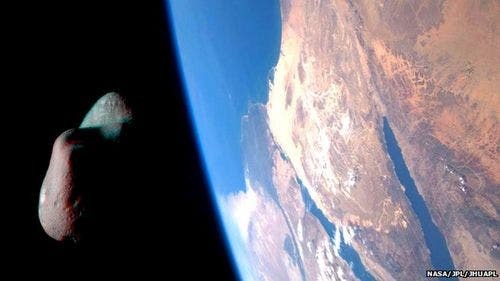 The space rock is about 37 feet (11 meters) wide and would have disintegrated in Earth's atmosphere long before it reached the ground, if it had reached the planet at all, NASA scientists said. The space rock passed Earth at a distance that is only about 0.17 times that between the Earth and the moon. For comparison, the moon typically orbits Earth at a distance of about 240,000 miles (386,000 km).